There is one metric that many mutual fund providers avoid: Maximum Drawdown. Maximum Drawdown measures the largest peak-to-trough fall in value for a portfolio. But we can use this metric and the MAR Ratio to evaluate the risk vs. return trade-off, and separate the winners from the losers. We identify portfolio recipes with annual returns ranging from 4.2% to 14.8% that have a better-than-average MAR Ratio. What is the metric that mutual fund providers fear? This metric has the power to make a decent-looking fund or portfolio look quite dreadful. You can't find this metric on the websites of Morningstar, Yahoo, Vanguard, or Fidelity. The metric is Maximum Drawdown. "Maximum drawdown is defined as the peak-to-trough decline of an investment during a specific period and is usually quoted as a percentage of the peak value," according to the asset management firm Robeco. In other words, it's a portfolio's greatest loss in value over the time period you're considering. For our analysis, the Maximum Drawdown is based on the total monthly return, including distributions. Because Maximum Drawdown is by definition "extreme," it allows investors to see the worst-case that a portfolio has suffered. Other risk metrics like standard deviation, while popular, can average out and thereby disguise periods of poor performance. Additionally, standard deviation penalizes portfolios by treating downside deviation (which is bad) and upside deviation (which is good) equally. Fidelity.com's mutual fund screener includes Sharpe ratio, standard deviation, beta, and R-squared... but not maximum drawdown. Vanguard.com provides a sparse set of risk metrics for each mutual fund: R-Squared, Beta, and a "Risk Potential" score. The "Risk Potential" ranges from 1 (low risk) to 5 (high risk). Maximum drawdown is not shown. Why is this a feared metric? This metric would put many mutual funds and actively managed portfolios in an unfavorable light. Fund providers don't want to point out the Achilles' heel of their funds. To be fair, the fund providers are not obscuring or hiding the data, but it's not always easy to find. A savvy investor needs to be aware of the Maximum Drawdown for any investment under consideration. Let's look at an example from Vanguard. Exhibit A (below) shows a graph that Vanguard publishes on Vanguard.com. By looking at the graph's underlying data (available by hovering over the graph on the Vanguard website) we can see a peak value of $11,127.66 in 2007 followed by a low value of $5,318.39 in early 2009. 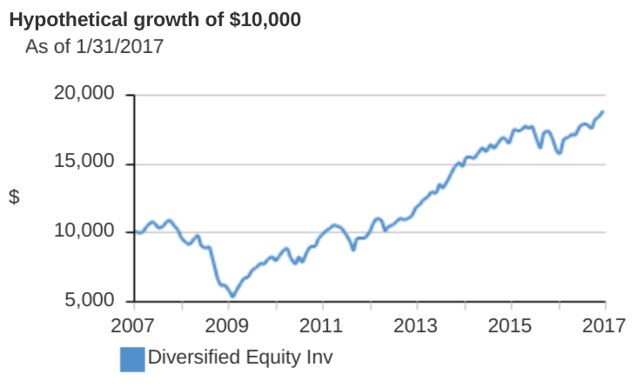 This is 52.2% drawdown from a fund with "Diversified" in its name. It took the fund about 3 years to recover from that drawdown. Caveat emptor! "When you see 25, 30, 40% drawdown… you feel so helpless. As you get older, you don't have the luxury of waiting and watching." Let's look a few more fund examples. By looking at the names or annual total returns for the funds below, we might expect them to be less risky. T. Rowe Equity Income Fund (MUTF:PRFDX) has a Maximum Drawdown of 53.2% and annual return of 5.5%. Sound Mind Investing Fund (MUTF:SMIFX) has a Maximum Drawdown of 50.7% and annual return of 5.3%. Vanguard LifeStrategy Growth Fund (MUTF:VASGX) has a Maximum Drawdown of 47.6% and annual return of 4.7%. UBS Global Allocation Fund (MUTF:BPGLX) has a Maximum Drawdown of 48.7% and annual return of 2.6%. This fund has the rather unappetizing combination of low return and a large Maximum Drawdown. What is the risk level that I am accepting by investing in a specific fund or Portfolio Recipe? Am I getting enough return for the risk I'm bearing? Where can I find maximum drawdown stats? Obtain monthly returns going back as far as you can get. Calculate the hypothetical value of the portfolio from month-to-month, using the total monthly return for each month. The total monthly return should include dividends and distributions. For example, start with $10,000 prior to your first month of data and then increase your portfolio value by the first month's percent return. Then repeat this for all subsequent months. Find the maximum peak-to-trough drop in value over the period you're considering. We suggest looking at least at the last 10 years so that you include the last major market drop in 2008. Express the drop in value as a percentage. This is the maximum drawdown. How can I invest more wisely using Maximum Drawdown? First, be aware of Maximum Drawdown (looking back 10 years or more) before investing in any portfolio or fund. Be sure the Maximum Drawdown calculation includes data from 2007-2008, since this was the period of the last major market downturn. Make sure you are comfortable with the level of risk. Next, use the MAR Ratio to separate the winner from the losers. The MAR Ratio compares maximum drawdown to annual return. It measures how much return you get compared to the portfolio's maximum drawdown. You can calculate MAR for a portfolio by dividing its Compound Rate of Return (i.e., CAGR or Annual Total Return) by the portfolio's maximum drawdown. The MAR Ratio's name comes from the Managed Accounts Report newsletter, which was founded in 1979 and published by Leon Rose. In our analysis, we use the past 10 years for MAR calculations, but another approach is to use all the available historical data since a fund's inception. When considering MAR, the rule is: the greater the MAR, the better. S&P 500 (NYSEARCA:SPY), has a maximum drawdown of 50.8% and annual return of 6.9%. Therefore, its MAR is 0.14. U.S. Aggregate Bonds (NYSEARCA:BND), has a maximum drawdown of 4.0% and annual return of 4.3%. We can calculate its MAR to be 1.08. BPGLX, as mentioned above, has a maximum drawdown of 48.7% and annual return of 2.6%, resulting in an abysmal MAR of 0.05. Vanguard LifeStrategy Growth has a maximum drawdown of 47.6% and annual return of 4.7%, and MAR of 0.10. Some investment professionals have suggested that investments should have a MAR of 1.0 or greater. However, that is a tight filter that not many portfolios will achieve. Additionally, with higher risk comes higher return, so an investor wanting higher returns must be willing to accept higher risk. Could a portfolio with an average return of 10% per year have a Maximum Drawdown of just 10%? It's possible, but this is a high hurdle. So while we are certainly on the lookout for portfolios with MAR above 1.0, let's loosen the constraint to be "MAR greater than 0.5" and see what that filter produces. What are some top portfolios after considering maximum drawdown? We ranked all the Portfolio Recipes that we track at RecipeInvesting.com, and ranked them by MAR. We found 29 Portfolio Recipes with a MAR of 0.5 or greater. In other words, for these 29 Portfolio Recipes, the maximum drawdown over the past 10 years was not more than twice the compound annual return over the same period. The top Portfolio Recipes, ranked by MAR, are listed below. Note that most of the strategic (i.e., static, buy-and-hold) Portfolio Recipes did not have a MAR greater than 0.5. Listed below are the Top 3 Portfolio Recipes in three categories: DIY Tactical, DIY Strategic, Managed Funds. The percentages reflect the past 10 years ending Jan 31, 2017. Ignore Maximum Drawdown metric at your peril. A portfolio's Maximum Drawdown is often omitted on websites and you may need to seek an alternate source or perform your own calculation. When choosing Portfolio Recipes, consider using MAR, which is the ratio of annual return to Maximum Drawdown. Our research revealed dozens of Portfolio Recipes that have a MAR greater than 0.5 and annual returns ranging from 4.2% to 14.8%.